Arya continues to exist in a universe completely separate from everyone and everything else. In the books Sam shows up in Braavos and even though neither knows who the other is, it’s more clear she is still in the same story and environment. It was smart to use familiar face and fan favorite Jaquen in place of the ‘old man’ who trains her in the book, but since Arya is the only main character he interacted with previously, it doesn’t help connect her. And besides being physically isolated, she is in training to literally become someone else. In theory, she’s doing all of this so she can return to Westeros as an assassin and get her revenge – but we haven’t even heard her recite her kill list since she first arrived in town. I love Arya, and I’m enjoying her story in and of itself, but I’m having trouble holding on to how it connects to the big picture. Anyway, Arya sets out in her new persona of Lanna the shellfish shiller, and stumbles on an insurance scam. When she reports back to Jaquen, he reveals the victim’s family hired them to take the guy out. He gives Arya a vial of presumed poison and she’s on her way to becoming a full fledged murderer for hire. The Waif doesn’t think she’s ready, but Jaquen is unconcerned either way. Dany grants Tyrion an audience that turns into an audition on both sides, and it’s not really clear what either decides, but they both agree on one point: Ser Jorah is banished once again. And so he returns to the slavers and the fighting pits because that worked out so well this time…Jorah the Explorer needs a better talking map. But back to the tea party. Tyrion has insight into Dany’s backstory that she herself can’t see: it was miserable and her life was constantly in danger, but it’s quite possible she’d be actually dead if people like Varys the Spider didn’t play all sides. And now Varys, like Jorah, seems to be all in on Princess Targaryen. 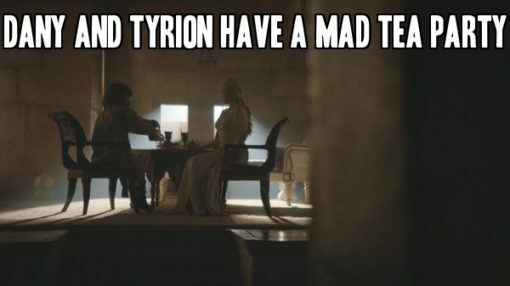 Tyrion, too, seems a bit smitten, at least with the idea of Daenerys, if not yet the reality of her. For her part, Dany does not know how to play all sides, or any sides, as much as she is trying with the fighting pits and the engagement (both of which Tyrion approves of). She’s much better at making vague mostly meaningless apolitical statements about ending the war of dynasties . . . to secure her destiny aka the restoration of her own dynasty. But sure. 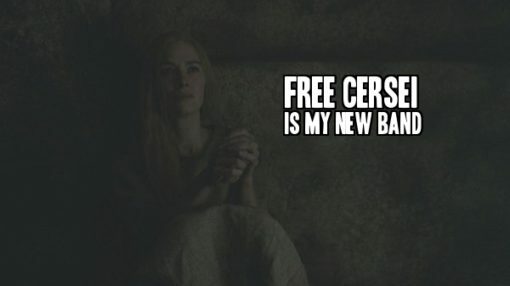 In King’s Landing Cersei is imprisoned, slowly losing her mind and clinging to what dignity and willpower she has left. The religious fanatics have taken over and the rest of House Lannister are no help. Jaime is too far to reach, Tommen is holed up in his chambers refusing to eat, and Uncle Kevan has returned not to intervene with Lancel on her behalf but to wrest power for himself. Cersei is a lion alone, held with a chain she forged herself. 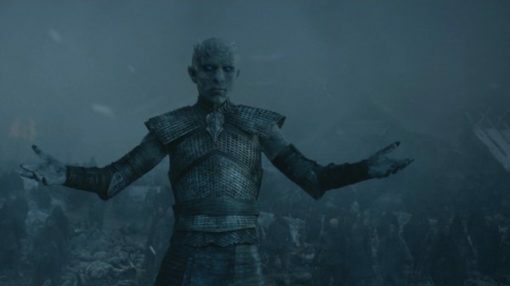 I’ve found the pacing off in this storyline all season – it’s somehow dragged and rushed at the same time – but I expect these scenes are satisfying to those who’ve been cheering for Cersei’s downfall. In Winterfell Roose Bolton plans to hang out inside the walls while Stannis and his army starve and/or freeze to death, which sounds like a good plan, tbh. But Ramsay thinks it sounds more cowardly than smart and gets permission to go on the attack with a 20-man strike team. Meanwhile, Sansa goes on the attack with Theon and learns, finally, that her younger brothers are alive – or at least were 1-3 years ago when Theon didn’t kill them. Sadly we have to wait a week or two (hopefully not a whole year!) to find out what Sansa will do with this information. But most of the episode takes place north of the wall, with Jon and Tormund attempting to recruit the remaining wildling tribes into joining forces with the Night’s Watch (we also get the third scene in as many weeks of Olly angsting about how terrible this plan is cuz the wildlings killed his family) . The Free Folk like the idea as much as the Night’s Watch did, which is to say they hate it. Tormund has to bludgeon the Lord of Bones to death before anyone will even listen to Jon, and the negotiations are rough because Jon is exactly as inexperienced and idealistic as Dany. It becomes very clear in these late 5th season episodes that it’s only their supernaturally high charisma scores that have gotten them both this far. It’s a very exciting sequence that about made up for the more meandering episodes that led up to it. I wish Karsi– the wildling woman who helped Tormund convince the non-Threnns to accept Jon’s proposal — survived because I loved her already. And I have some lingering questions such as “are the Wights/Walkers afraid of water?” But it is a satisfying 20 minutes capping off a satisfying hour.